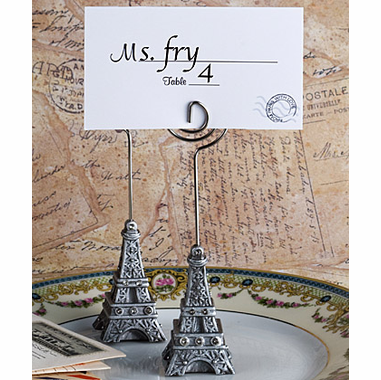 These Paris party theme table place card holders will look fantastic on your event tables and will remind your guests of the unique party afterward when they put a photo of the festivities in the clip! This is the perfect compliment to Paris theme parties such as a wedding,theme prom or travel party. Each measures 4 ?? tall x 1? 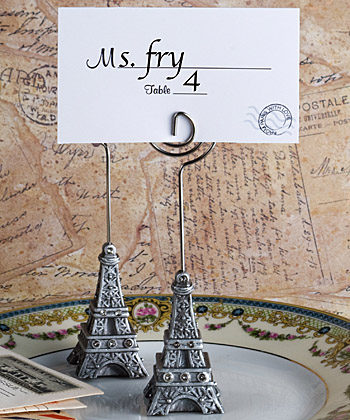 wide and features a detailed pewter colored poly resin Eiffel Tower replica, enhanced with glistening rhinestones, topped with a silver metal coiled wire designed to hold the event day place card or a photo/note. Sure to up the romance in the room, these Eiffel Tower favors come bulk packed in a poly bag with ?From Paris with Love? themed, postage stamp design blank place cards included.